Walk into Tidewater Community College’s new piano lab during a class session and all you’ll hear is the faint clicking of keys. 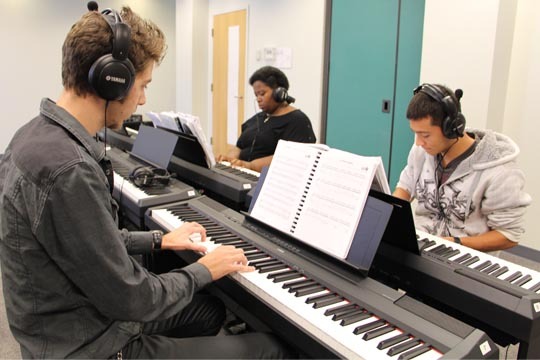 The $16,000 practice space is essential to the music program’s new Piano Class 1, which teaches new and beginner-level students how to play the piano and read music. Subjects covered in the course include sight reading, rhythm reading, chord progressions, major and minor keys and harmonizing. Every music major is required to pass a piano proficiency test before graduating. 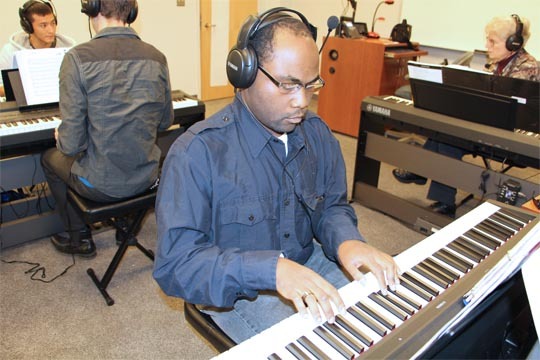 While the college had previously offered private lessons for advanced students, entry-level piano players were tasked with finding their own lessons to gain proficiency. More new equipment for the music program is expected this spring including stand-alone, modular practice rooms, musical instruments and sound equipment for the TCC ensembles. This equipment is being provided through a grant from the Virginia Community College System. Piano Class 1 will culminate in a recital on Dec. 14. During the final class period, students will go next door and trade in their keyboards for the Steinway.